As promised, our new incentive plan for 2016 is now available! Download your UFO Project List form and bring it in to Country Patchworks to kick things off! The incentives are simple: Just take an inventory of all those unfinished projects on your sewing table (those pants you never finished hemming, the pillow that just didn’t get finished, or that quilt you need to finish piecing) and bring the list into Country Patchworks. For each project you finish, you’ll earn bonus cash you can use to fund future projects! Click here to download the UFO Project List, or come by the store to pick one up! How about a goal for this winter? Let’s all work to finish 4 projects from your UFO list. Anyone who completes 4 projects before April 15 will receive an extra special bonus! Our January 2016 newsletter is packed FULL of great news and promotions – including details about our most innovative promotion ever – The 2016 UFO Incentive Program (for Un-Finished Objects)! Download the newsletter now to learn more! Interested in the January-March Calendar of Events? You can download that here, too! What could be more fun than making an apron from a kitchen towel? Match your kitchen décor and utilize the perfect place to show-off your sewing machine’s decorative stitches, finish with a ruffle and tie-one on! This is a great project to do with the kids, they’ll love picking out different stitches and thread colors! See the full project materials list and download the instructions PDF document here! Repurpose a doily or two from your attic, or you can find them at the thrift store. 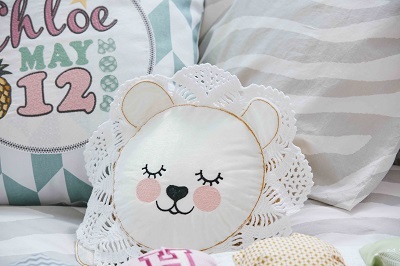 Turn them into these adorable lion pillows. They will be sweet keepsakes and would be a perfect decoration in a child’s room or any other place you choose. Download the full instructions here! Custom Embroidered Belt – any size! Embroider the belt as long as you need, with the Endless embroidery hoop and the beautiful embroidery design from your HUSQVARNA VIKING® DESIGNER JADE™ 35 machine. Finish the belt with a mini piping, the extra detail that will make it look fabulous. Select your favorite embroidery thread colors in the Intro Embroidery PC software before you even start.